I just read a mildly disturbing article in the New York Times called “What Brand Is Your Therapist?” The author Lori Gottlieb was a full-time journalist who took six years to retrain as a psychotherapist — her website, but not the article, says she has a master’s degree in clinical psychology. Yet she found herself virtually unemployed after several months and in search of marketing consultants to attract clients. The thrust of the article is that such marketing involves branding, i.e., defining a niche that promises quick, painless, easily grasped results, and then promoting oneself online and elsewhere using that brand. Gottlieb is clearly uncomfortable about the trade-offs inherent in branding and marketing psychotherapy services. Traditional psychotherapy is often painstaking, uncomfortable, and lengthy, and thus hard to sell. In contrast, one-time phone consultations and executive coaching are brief, feel-good interventions that lend themselves to snappy, positive catchphrases that sell better. Such services may be “fast-food therapy — something that feels good but isn’t as good for you; something palatable without a lot of substance.” Moreover, she notes that many sales techniques clash with the tenets of traditional psychodynamic therapy. Sharing personal details makes one more approachable and “human,” at the cost of complicating and possibly precluding transference work. Active use of social media such as Facebook and Twitter can attract potential clients and publicize one’s “brand,” but may also blur relationship boundaries essential for effective psychotherapy. Gottlieb lays out the dilemmas well in her article, but her practice website illustrates the practical conclusion: Lots of “selling” of various services, few of which are recognizable as psychotherapy. 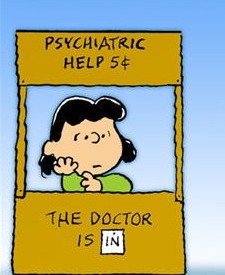 Of course, I am writing this on my psychiatry blog, which is linked to my own practice website. I too have grappled with similar trade-offs. I launched my website over five years ago, and started the blog about a year later. Several months ago I heeded marketing advice I found online: I re-wrote my website in the first-person and added photographs. I expanded the sections on my hospital committee work and past research. I included more practical information about my practice. Like Gottlieb, I had mixed feelings about doing this. On the one hand, helping potential patients make more informed choices sounds innocuous enough. I want suffering people to be able to find me and to know what I can help with. I want the process of engaging in psychotherapy to be as transparent as possible. I explain what I do, and even list my fees on my website (most of my peers don’t). On the other hand, I’m concerned that branding and marketing commodifies a personal healing relationship. It offers to treat psychological issues in little bite-sized pieces, misleadingly suggesting that therapy to resolve one’s indecision about marrying, say, can be completely separate and distinct from therapy to deal with career indecision. It conflates psychotherapy with counseling and coaching, all of which are useful but different things. Mainly it risks dumbing down psychotherapy. Psychotherapy is often complex if done carefully, and in my opinion it can’t be conducted as well over the phone, by email, while sitting by the pool with Skype running on one’s laptop, or in a guaranteed four-session package. I haven’t availed myself of the whole branding arsenal, since I strive to maintain a psychotherapy practice worthy of the name. If I ever write a book, offer coaching services, or engage in public speaking, those activities will be clearly distinct from my role as a psychotherapy-oriented psychiatrist. Moreover, patients and would-be patients seem to agree that informational websites are useful, but that too much branding and self-promotion by a psychotherapist is a turn-off. That makes good sense, and encourages me to take another look at my own website — I may turn it down a little. What do you think? If I were looking for therapy in your town I would find your site very helpful because it explains what I am getting into. The only thing that turned me off was seeing your photo of yourself. That seemed more about you than about the therapy. I liked the use of the first person in writing thouth. I too read Gottlieb’s piece. As is typical for these kinds of articles, she missed the forest for the trees. The second point she actually touched on, but didn’t really explore. That is, with our nation at the end of the self-esteem movement, most people who aren’t hard-core Axis II sufferers tend to identify problem as outside themselves (frankly, sometimes with very good reason). They think they’re just fine, but their wife/boss/mother/job/bank/doctor is the reason for their misery. These are not good candidates for psychotherapy over the long term. Finally, EVERYTHING these days is commodified. Just read anyone’s Facebook page. And like a tennis player who’d like to reach Wimbledon but isn’t ready to compete with the kids who live, breathe, and sleep tennis starting at age 4 like the Williams sisters, guess whose going to lose in that showdown? Yep. If you try to practice an uncommodified psychotherapy, and you’re just starting out now, prepare for many lean years. Thanks for the good post on this. Happy New Year.